After listening to quite a few Harry Dresden novels, I wanted to read a Dresden novel again. Jim Butcher is not a writer I read to marvel at his prose. His writing is serviceable, but it does not ever amaze me. Granted, I have never read a first person novel where I was impressed with the writing. That tends to happen with 3rd person more. 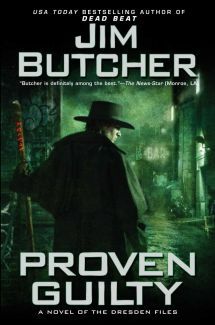 It is hard to believe that this is the 9th book in the Dresden universe I have read, putting Butcher up with a few writers I have read more than 6+ books from. What I like about his books is that Harry is a good person. He is a hero that you can root for. He is a good guy who tries his best all the time to do the right thing. Sometimes there are consequences (even dire) from him trying to do the right thing, but he is a genuine good guy which is kind of hard to find right now in fiction/media in general. Everyone seems to be heavily flawed, moody, or some other character flaw. He is just a good guy. Proven Guility is another Dresden novel that is quite good, and the first one in the series to break out of the formula of a pure detective (noir) novel. This book does not start with a client coming to Harry, but rather the mystery is brought to him from members of the White Council and this book has more to do with the ever-expanding backstory of the Dresdenverse. I find the overall arcing story a bit more interesting than the other mysteries. They are good, but I like serialized stories (both in my books and TV). This is an important story in the whole arc, and one of my favorites now. After a misstep with Blood Rites, Butcher has been on a good pace of late with me. Unlike all of the other books in the series, this one cannot be read as a stand-alone. You need the context of the other novels. I know he tries to write them all as stand-alone, but this one cannot stand-alone. You would be missing too much backstory. If you are a fan of Dresden, this one is a must read. A lot of things change in his world with this book.